It’s not long now until we can step back into the Nazi-blood-stained boots of B.J. Blazkowicz in Wolfenstein 2: The New Colossus. We’ve already primed you on the game’s story, we’ve already talked you through the characters, and we’ve already laid out the perks. Now it’s time to talk you through the new features. 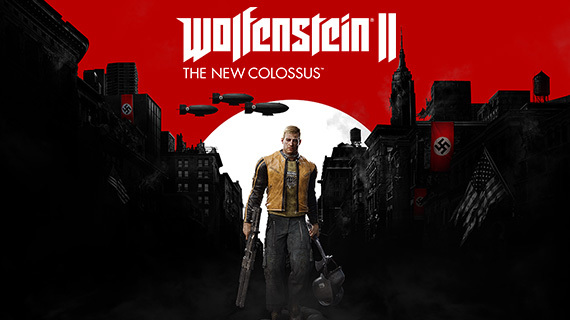 Wolfenstein 2: The New Colossus B.J. There hasn’t been much shown of this, but it is pretty clear that B.J. ends up using an exoskeleton to get around. This means there is scope for faster movement, higher jumps, and heavy hits. One of his perks allows him to run over enemies with a sprint, so expect it to be a powerful addition to your arsenal. Holding a gun in each hand is nothing new to Wolfenstein, but The New Colossus opens that system up for more freeform expression. Rather than restricting us to the same gun in each hand, this sequel will allow us to pop different firearms in our left and right hands. You can have an assault rifle in your left hand, peppering distant enemies, while at the same time shotgunning anyone who comes close with your right hand. It should make B.J. even more of a force to be reckoned with. This sequel takes us to occupied America, where B.J. must join up with local resistance cells to fight back against the Nazi regime. The Nazis already have their foothold, so you will be forced to employ guerilla tactics as you try take it back. To make matters worse, the Nazi regime has also teamed up with the Klu Klux Klan. This does mean you get to shoot both, however, so win-win. As reported by PCGamesN, Wolfenstein 2 introduces the Tension System. This tracks the chaos that is happening on-screen and changes B.J.’s behaviour based on what is going on. If you are strolling down the street and decide to reload, he will do so casually. If you are reloading under fire, it will be more desperate and rushed. There are a range of new animations to make combat seem more exciting, with the Tension System tracking it all as you play, even changing the tempo of the music. Wolfenstein II begins in 1961, following the fateful events of the assault on Deathshead’s compound. B.J. is still recovering from his wounds on a stolen U-boat called Eva’s Hammer. Perks - How Will You Customise Your Character? In Wolfenstein II: The New Colossus, you will be free to play your way. Do you prefer to skulk around and pick off enemies one at a time? You can! Confused about what it all means? Let us take you back and recap all the Wolfenstein games so far, in chronological order.